Showing results for tags 'scottish cup replay'. Dundee Replay. After their winter break Dundee come North looking to put Championship side Inverness Caledonian Thistle out of the Scottish Cup. The first tie ended in stalemate and the prize up for grabs is a home tie against Premiership side Motherwell. A precautionary pitch inspection is planned for Tuesday lunchtime to see if the pitch is holding up after recent drookit weather of biblical proportions. Inverness went to Dens park and justified Robbo's faith in his own side when he said it would not be a shock to him should Inverness progress into the next round. Well, it never quite went to script but we earned a replay with a deserved 2-2 draw. Neil McCann was blaming rustiness for his sides failure to get through at the first time of asking. Aaron Doran started the scoring and Dundee replied through Sofien Moussa and Mark O'Hara before George Oakley knocked in the late equaliser to send the tie to a replay. Since then, we have been to Falkirk in the Championship, and with a depleted squad through injury and suspension, we lost 3-1. We had fared pretty well until Jake Mulraney went berserk. A booking just before half time, another dubious tackle seconds later then yet another crude challenge gave the referee no other option but to send the nutter packing. We often complain about poor refereeing, but I'm afraid this was all Jake's doing. He let the team, manager and support down, but more importantly he let himself down. Robbo will be introducing stricter discipline rules within the club and that is no surprise as that was our eighth red card this season. Talk about shooting yourself in the foot. He's not the first this season that has let the side down, let's hope he's the last though. On the bright side, youngsters Daniel Mackay and Jack Brown came on against Falkirk and combined to score a brilliant goal, Mackay superbly finishing off a brilliant assist from Jack Brown. Dundee have played twice since the cup draw. A home game against Hibs in the Premiership on Tuesday night and an away game at Hamilton on Saturday. They went down 1-0 to Hibs and McCann was left furious by refereeing decisions going against his side. Aye, tell us about it Neil. They fared better at Hamilton after a very late goal in time added on to the time added on gave them all three points. It was hyphen man AJ LS that got the winner with Mathew Henvey getting Dee's opener after Hamilton had benefited from an og from Mark O'Hara who sliced the ball into his own net. Pity he could'nt do that against us in the first game instead of running half the pitch and smashing the ball into the net, meh! 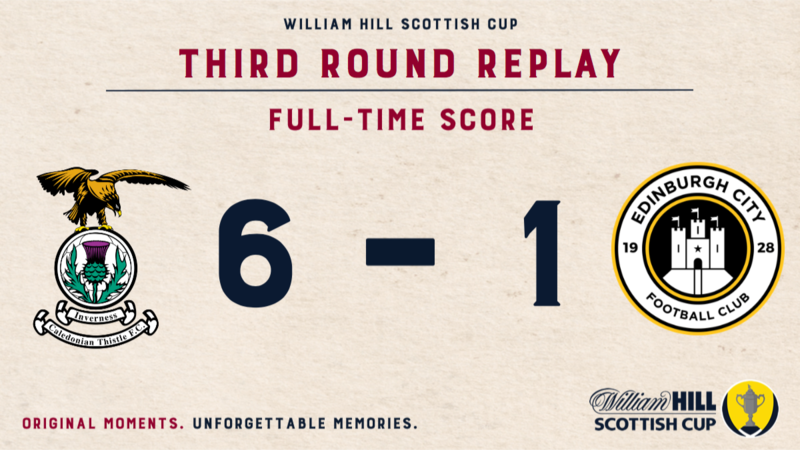 Hamilton were undone by a sending off as well, David Templeton trying to outdo Mulraney for the fastest two yellow cards of the season. John Hendry has been attracting the attention of other clubs and Dundee are reported to have turned down a bid from Celtic for the talented young defender. Another one about to be paid a lot to sit on a bench probably. James Vincent, he of Caley Thistle Scottish Cup fame has left Dundee and gone to Dunfermline on loan. This is what the draw looks like at present. You would imagine Hearts, Falkirk and Fraserburgh will join Brora for the fifth round games. Would be a shame not to get that opportunity to join them, so it's all to play for on Tuesday night....... Inverness should have Iain Vigurs and Liam Polworth back after suspension. Jake Mulraney's suspension will be for the next Championship game, although Robbo was raging after the Falkirk game and he might be punished by the club and miss out. Tremarco is a long term absentee. Nathan Austin was missing, presumed injured still, against Falkirk. We need someone with a bit of flair to create the opportunities for Oakley and Bell, let's hope he has recovered for this game, but it's doubtful. Dundee are beginning to find their feet again as Neil McCann steadies the ship. He is looking to bring Toni Martinez in from West Ham. The Spaniard has scored 12 goals for the Hammers under-23's this season, although McCann reckons he might be out of their league. Hendry may be included after missing the first game through manflu. This lad has plenty quality and was missed in the first encounter. tm4tj prediction:- With our midfield taking on a more familiar look with Vigurs and Polworth returning that will give us a better balance in the engine room. Aaron Doran will feature in this one after not being risked at Falkirk on the artificial surface. Strong shouts for youth to get their chance after Daniel Mackay scored his second for the Caley Jags. Maybe not in this one with Dundee up for it, but surely in coming games he will be slowly introduced. AJ -LS is getting amongst the goals and will be a test for our defence once more but with Coll Donaldson playing well for us we might be able to keep him and Sofien Moussa quiet. Another tough game to call and it might take extra time and penalties to separate the sides. If we can keep eleven men on the park, we should be a match for the bottom six clubs in the Premiership. When we plumb the depths, we are barely a match for the Highland League clubs. I'll go for us to oust the Dark Blues, but given our recent shady performances, it's anyone's game. ICT after extra time, Motherwell (at home) here we come.